Sometimes, audacity, spirit and talent will open doors that are reputed impenetrable. In barely fifteen years, Manufacture ROGER DUBUIS has entered the world of Fine Watchmaking and won the recognition of its peers. Now the company embarks on another chapter in its history and enters a new era. An era of greater mechanical maturity with the development of innovative movements that exactly meet the requirements of the most demanding connoisseurs; an era of aesthetic maturity with the launch of a new collection with an assertive design. This is also an era of industrial maturity with the implementation of manufacturing procedures that marry the latest technology with the precise demands of the Poinçon de Genève. Tighter collections, products that target collectors and connoisseurs, entirely new global communications and worldwide selective distribution all contribute to the exceptional vitality of this daring brand. ROGER DUBUIS is more than a Manufacture, more than a brand: it is its own world. An exciting, animated world. A world where creativity reigns supreme, where originality is king and the pursuit of excellence is truly a driving force. A brand that is intentionally extravagant, elegant and worthy of the best in Fine Watchmaking. New worlds will open up fabulous horizons and nurture the history of a young brand that loves to innovate as much as it respects the classic idiom of Fine Watchmaking. This is what makes ROGER DUBUIS unique. Making its debut in 2011 is the Excalibur Lady line with a model in several versions, for women only. This elegant and seductive watch catches the eye with distinctive dials, in pure ROGER DUBUIS style, and incorporates mechanical movements which have been developed by the Manufacture, each hallmarked with the prestigious Poinçon de Genève. Combining force with subtle sophistication, these 36mm diameter models are proposed in steel, white gold or rose gold, with or without diamonds. In addition to the characteristic indented bezel and triple lugs of the Excalibur collection, this new lady's version adopts an elegant dial, circled with stunningly tapered Roman numerals. Stretched to infinity, and an integral part of the brand's DNA, these Roman numerals are magnificently set against the satin sunburst dial. The rose gold case, which is water-resistant to 3 bar (30 metres), is framed by a bezel paved with 48 diamonds (1.44 carats). 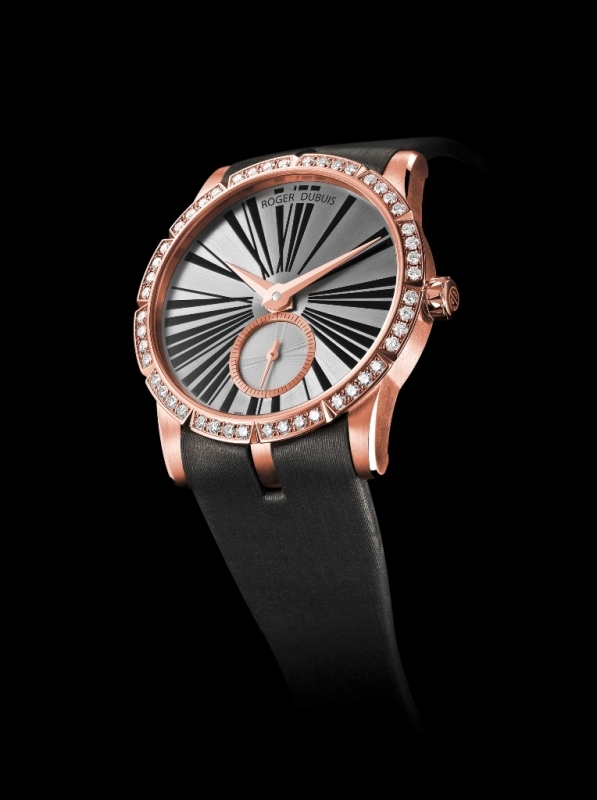 The power of seduction of the Excalibur Lady watch goes beyond its beauty. Its RD821 self-winding mechanical movement meets the exacting criteria of Fine Watchmaking. Hallmarked with the prestigious Poinçon de Genève, it has also been awarded COSC chronometer certification by the Contrôle Officiel Suisse des Chronomètres. A twofold guarantee of craftsmanship and precision that distinguishes only a rare few mechanical movements. Calibre RD821 proposes hour and minute functions with small seconds at 6 o'clock. This rose gold Excalibur Lady watch is presented on a grey satin fabric strap with a rose gold adjustable folding buckle.